Ravioli with sautéed mushrooms is an easy pasta dish featuring ravioli with golden sautéed mushrooms, toasted pine nuts and a sprinkle of parmesan and basil. It comes together in minutes and makes an elegant presentation. Are you a mushroom fan? Mushrooms seem to be one of those vegetables that people either love or hate. I am definitely in the love category. 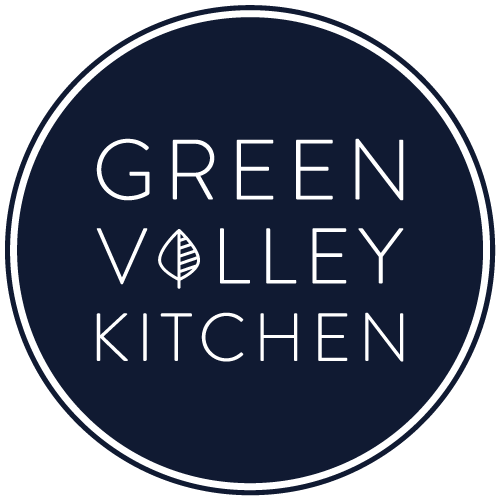 I’m a big fan of their earthy, savory flavor and health benefits. I used white button mushrooms in this dish. I think the secret to cooking mushrooms is to make sure that you cook them over a high enough heat so that they become lightly caramelized and golden brown. This dish is very simple to make and comes together quickly. There’s no fancy sauce, just a little butter and parmesan to coat the ravioli. The butter gives the dish a hint of sweetness which works well with the savory mushrooms. 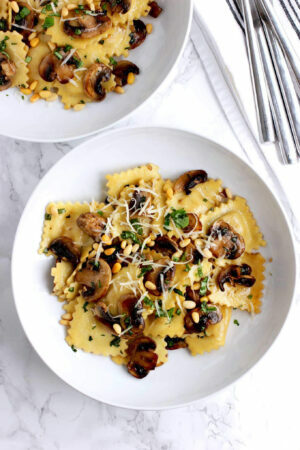 Once the ravioli are cooked, they are tossed with the butter, sautéed mushrooms, toasted pine nuts, chopped basil and a little sprinkle of parmesan to finish the dish. It’s one of the dishes that looks like it took a lot of effort but really was easy and quick to put together. You want to cook the mushrooms over medium high heat for about 8 minutes. The secret to getting the mushrooms to turn a nice, caramelized brown is to leave them alone (don’t stir them) for the first 3 minutes in the pan. They will give off a little moisture which will evaporate over the medium high heat. After 3 minutes, stir occasionally until they are brown on both sides. This recipe comes together really quickly. So have all your ingredients prepped and ready to add. Take the time to get everything ready before you start cooking and this dish is a snap to make. I used cheese ravioli but spinach or mushroom ravioli would be good choices also. 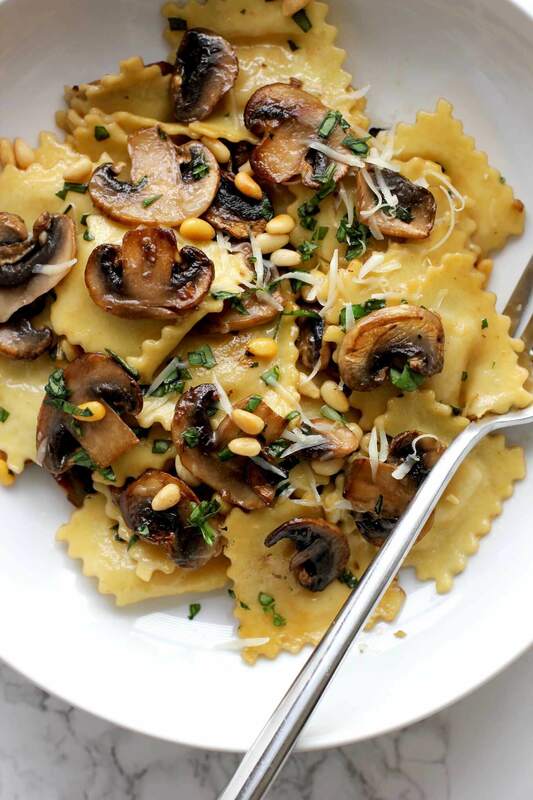 A quick, easy, elegant dish using ravioli, sautéed mushrooms, pine nuts, basil and parmesan. Bring a large pot of water to a boil and cook ravioli as per the package instructions. Toast the pine nuts in a large non-stick saute pan over medium heat until golden brown – 1 to 2 minutes. Make sure to shake the pan often since they will burn easily. Remove and set to the side. In the same pan that you toasted the pine nuts, heat the large non-stick saute pan over medium high heat. Add 1 tbs olive oil to the pan and then the mushrooms. Let the mushrooms cook for 3 minutes before stirring. After the 3 minutes are up, add the minced garlic and fresh black pepper. Stir occasionally until mushrooms are a golden brown color – about 5 more minutes. Drain ravioli when ready and add to the mushrooms in the large saute pan. Add the pat of butter, most of the parmesan cheese and chopped basil. Toss gently to combine. Divide and serve with the remaining parmesan sprinkled on top. This is a fabulous recipe! I had to modify it slightly (no pinola – allergies) and no butter, only added a bit extra olive oil, but it is definitely a keeper! Thanks so much, Yaakov! Glad you enjoyed it. Made this delicious recipe for a group lunch on our cold Super Bowl Sunday! Definitely an easy lunch idea – glad you enjoyed it! Yes, I am a big fan of mushrooms :)) And I think your dish is a great combination( you know, mushrooms and pasta and everything 🙂 ). It looks so attractive and tasty. Thanks so much, Sabrina. It’s super easy to make too – which is always a big plus in my book. Look at those glorious golden seared mushrooms! Oh my word Geraldine. So many craveworthy ingredients going on in this dish – lovely autumn warmth. Also like that you added a touch of basil, I don’t think I would have thought of that but I bet it tastes perfect here. I hope the fall is treating you well and that things are starting to cool down in LA. We’ve been getting cooler days here just recently and I think I like it 🙂 Cheers Geraldine, have a great weekend. Thanks so much, Kelly. We got a touch of rain this morning – which was very welcome – but it’s supposed to heat up to the 90s again this week :(. Fall will get here eventually but I wish it would hurry up! This is my kind of dish!! I am a lover of mushrooms, especially when they’re caramelized exactly as you have here! This is a perfect weeknight meal, my friend! Thank you! I LOVE quick and easy dinners like this. Dreaming of a big bowl of this right now! A lovely and simple recipe for a fabulous meal! Mushrooms are just so fallish- I like to mix dried ones in with fresh as well. I’m definitely in the LOVE category of mushrooms, Geraldine, and your beautiful dish shows your passion for them too. I could eat this every day – all my favorite ingredients! Gorgeous photos! Thanks so much, Robyn! 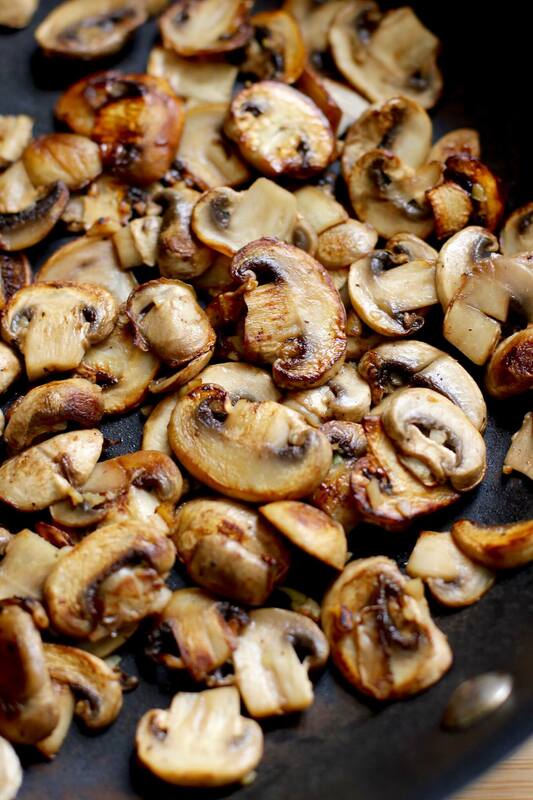 I’m such a big mushroom fan – love adding them to any recipe I can! Thanks so much, Traci – this is such a simple dish to put together using store bought ravioli – there are so many great flavors combinations at the market. Hope you have a great weekend! Mushrooms are my favorite! Love how simple this pasta dish is. I’m in the love category Geraldine, and when I saw this on IG this morning I had to come right over and check out the recipe! So easy and sounds so incredibly delicious! Tom loves mushrooms too, so this will be whipped up at our house shortly! Yay, Mary Ann – hope you and Tom try and enjoy it! I used to hate mushrooms but once I learned to cook them correctly I love them. You are so right about leaving them alone and letting them caramelize. This pasta looks weeknight perfect! Thanks, Karen – I agree, I think a lot of people don’t like mushrooms because they don’t cook them correctly. I am in the in between camp for mushrooms. I used to absolutely hate them, but as I get older they grow on me. And if they are prepared right I DO really really like them. Take THIS dish for example – ohhh my gawd, LOVE! Seriously this looks so fancy, Geraldine, but I love that it’s actually a breeze to throw together!! Definitely adding this one to my must make list! SO YUM! Cheers, dear! I am in the LOVE category for mushrooms! I love how simple this is to prepare! Perfect for a satisfying weekday meal!